On October 6, children ate Okinawa soba made using the local products in the parking lot near the Motobu Commerce and Industry Association. On October 6, the Motobu Commerce and Industry Association (MCIA) held a Soba Fair at Motobu, which since 2010 has been promoting itself as the home of Okinawa soba. 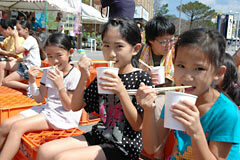 In the fair, they provided 1000 free servings of Okinawa soba made using ingredients from Motobu. Many locals and visitors enjoyed the soba. The ingredients included the likes of goat meat and bonito stock, fish cakes and kaori-negi, a local variety of green onions that the Motobu Farmers Association promotes. Food manufacturer Imoto prepared 1200 kilograms of local noodles that they have been selling from this year.